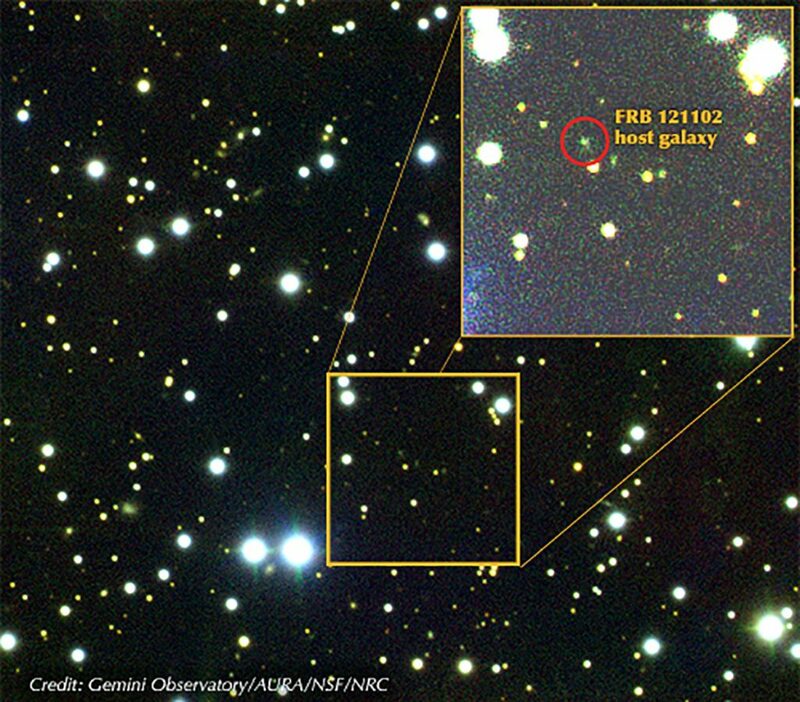 For the first time, astronomers have pinpointed the location in the sky of a Fast Radio Burst (FRB), allowing them to determine the distance and home galaxy of one of these mysterious pulses of radio waves. The new information rules out several suggested explanations for the source of FRBs. 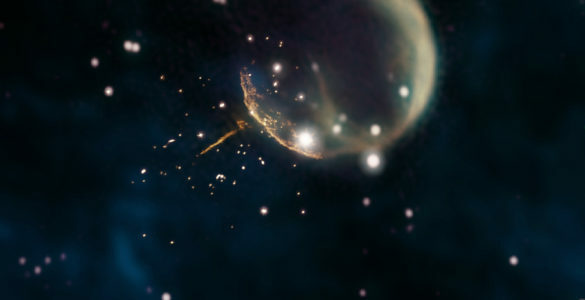 “We now know that this particular burst comes from a dwarf galaxy more than three billion light-years from Earth,” said Shami Chatterjee, of Cornell University. “That simple fact is a huge advance in our understanding of these events,” he added. Chatterjee and other astronomers presented their findings to the American Astronomical Society’s meeting in Grapevine, Texas, in the scientific journal Nature, and in companion papers in the Astrophysical Journal Letters. 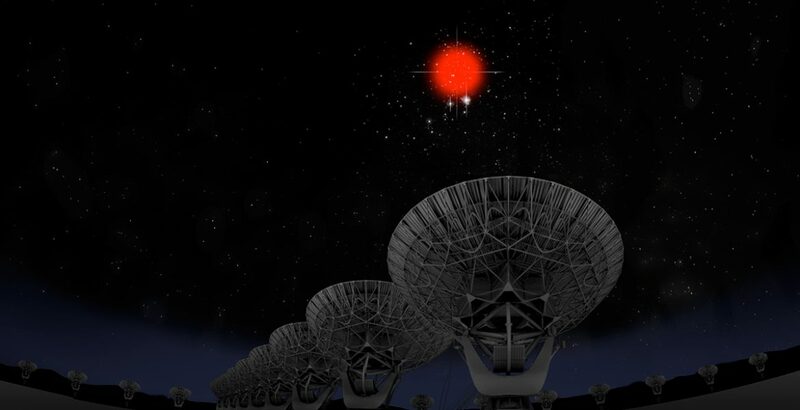 Fast Radio Bursts are highly-energetic, but very short-lived (millisecond) bursts of radio waves whose origins have remained a mystery since the first one was discovered in 2007. That year, researchers scouring archived data from Australia’s Parkes Radio Telescope in search of new pulsars found the first known FRB — one that had burst in 2001. There now are 18 known FRBs. 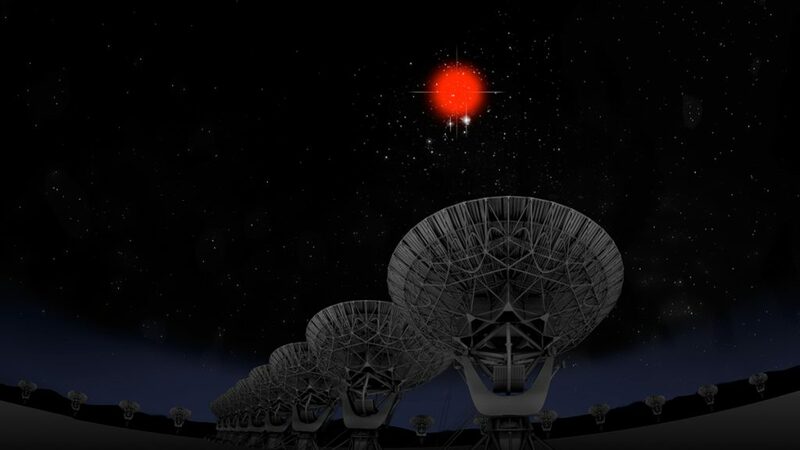 All were discovered using single-dish radio telescopes that are unable to narrow down the object’s location with enough precision to allow other observatories to identify its host environment or to find it at other wavelengths. Unlike all the others, however, one FRB, discovered in November of 2012 at the Arecibo Observatory in Puerto Rico, has recurred numerous times. The repeating bursts from this object, named FRB 121102 after the date of the initial burst, allowed astronomers to watch for it using the National Science Foundation’s (NSF) Karl G. Jansky Very Large Array (VLA), a multi-antenna radio telescope system with the resolving power, or ability to see fine detail, needed to precisely determine the object’s location in the sky. In 83 hours of observing time over six months in 2016, the VLA detected nine bursts from FRB 121102. “For a long time, we came up empty, then got a string of bursts that gave us exactly what we needed,” said Casey Law, of the University of California at Berkeley. “The VLA data allowed us to narrow down the position very accurately,” said Sarah Burke-Spolaor, of the National Radio Astronomy Observatory (NRAO) and West Virginia University. Using the precise VLA position, researchers used the Gemini North telescope in Hawaii to make a visible-light image that identified a faint dwarf galaxy at the location of the bursts. The Gemini observations also determined that the dwarf galaxy is more than 3 billion light-years from Earth. 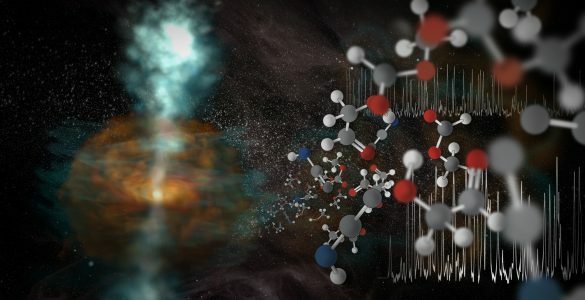 “Before we knew the distance to any FRBs, several proposed explanations for their origins said they could be coming from within or near our own Milky Way Galaxy. We now have ruled out those explanations, at least for this FRB,” said Shriharsh Tendulkar, of McGill University in Montreal, Canada. In addition to detecting the bright bursts from FRB 121102, the VLA observations also revealed an ongoing, persistent source of weaker radio emission in the same region. 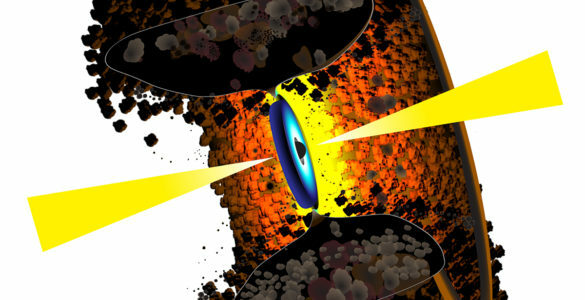 Next, a team of observers used the multiple radio telescopes of the European VLBI Network (EVN), along with the 1,000-foot-diameter William E. Gordon Telescope of the Arecibo Observatory, and the NSF’s Very Long Baseline Array (VLBA) to determine the object’s position with even greater accuracy. 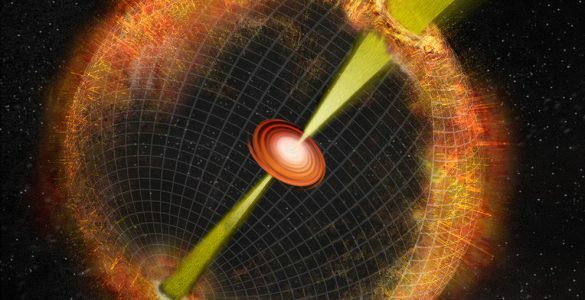 “These ultra high precision observations showed that the bursts and the persistent source must be within 100 light-years of each other,” said Jason Hessels, of the Netherlands Institute for Radio Astronomy and the University of Amsterdam. 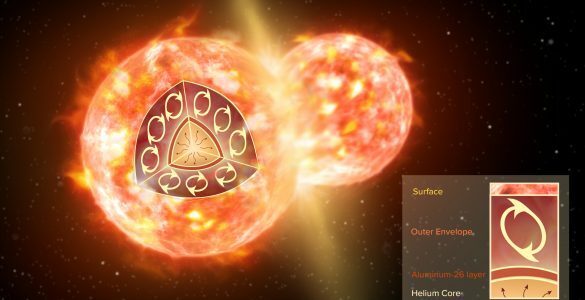 “We think that the bursts and the continuous source are likely to be either the same object or that they are somehow physically associated with each other,” said Benito Marcote, of the Joint Institute for VLBI ERIC, Dwingeloo, Netherlands. 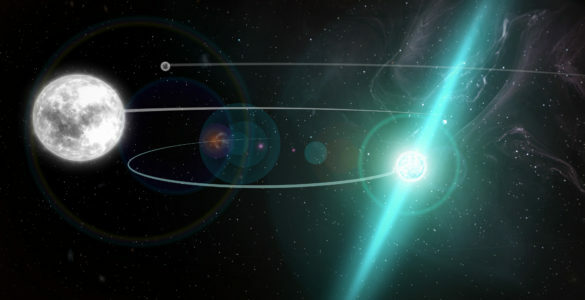 The top candidates, the astronomers suggested, are a neutron star, possibly a highly-magnetic magnetar, surrounded by either material ejected by a supernova explosion or material ejected by a resulting pulsar, or an active nucleus in the galaxy, with radio emission coming from jets of material emitted from the region surrounding a supermassive black hole. “We do have to keep in mind that this FRB is the only one known to repeat, so it may be physically different from the others,” cautioned Bryan Butler of NRAO. “Finding the host galaxy of this FRB, and its distance, is a big step forward, but we still have much more to do before we fully understand what these things are,” Chatterjee said. Visible-light image of host galaxy.